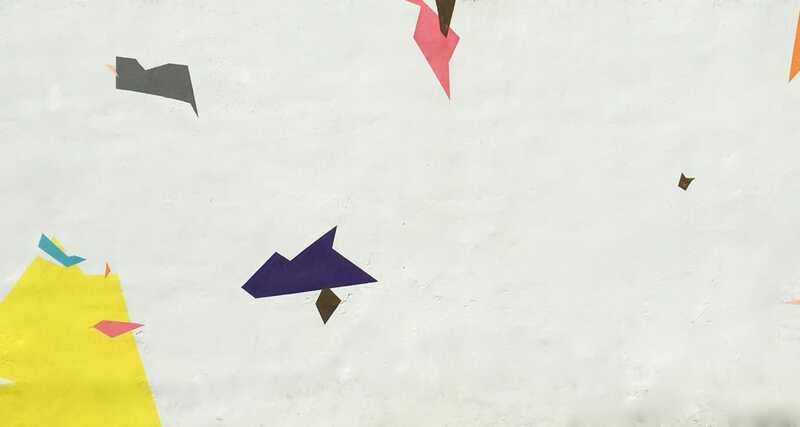 Artist Jennifer Leatherby’s mural is constructed of distinct, geometric forms. Measuring 10-feet by 20-feet, the composition incorporates multiple abstract shapes which are vividly painted — yellow, grey, purple, pink, orange or turquoise — on a solid white background. The artist distilled these forms into blunt, philosophically charged geometries. These pared-down facets appear “folded” and utilize shifting axes in the overall design. Stripped down to its essential quality, each colorful shape shows elements of both the fragmentation and synthesis. Leatherby has achieved a simplicity within the arrangement that is completely original. “I won’t decide exactly what I’ll do until I’m making it,” she said. Untitled Wall #1 was the fourth painting in a series of murals on the building’s east side. Just left of Leatherby’s composition are other murals, including a purple Egyptian dreamscape, by artists Asphate and Leter91, and a message in giant calligraphy, “This must be the place,” by Anna Frederick. Inspired by minimalism and the digital age.